After nearly a decade away, Travis Touchdown is back in a new title that departs pretty drastically from the No More Heroes formula. But is that a good or a bad thing? The game begins familiarly enough, with Travis minding his own business in a trailer in the woods when he’s suddenly attacked by…not a rival assassin looking to take his position for once, but by Bad Man, the father of Bad Girl from the original No More Heroes, who’s understandably a little upset with him over the whole assassinating his daughter thing. 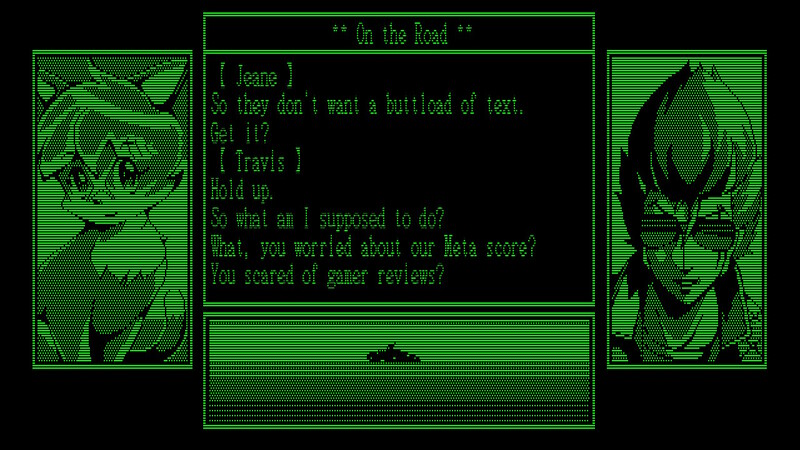 The bat-wielding ex-parent and our favorite jerk assassin are going head to head…when Bad Man notices Travis has the rare unreleased Death Drive Mk II console, and the two sit down to play some video games instead. No, really. The rest of the game involves the pair battling their way through the DD’s six games based on a rumor that anyone who does so will have a single wish granted. There’s more I could say, but that about sums up most of it. In typical Suda51 fashion there’s plenty of things alluded to that may or may not be important, organizations and conspiracies, all leading towards a horrifying truth, while at the same time being an excuse plot to justify the content of the game. It doesn’t appear to take itself too seriously, but at the same time there’s little threads here and there to piece together, some of which won’t be apparent unless you’re familiar with other Suda51 games. So, there’s perhaps one thing I should probably make clear: This is not really a No More Heroes game, at least where gameplay is concerned. Story and tone, sure, but if you’re expecting the same sort of finesse that the previous titles had, you will be sorely disappointed. 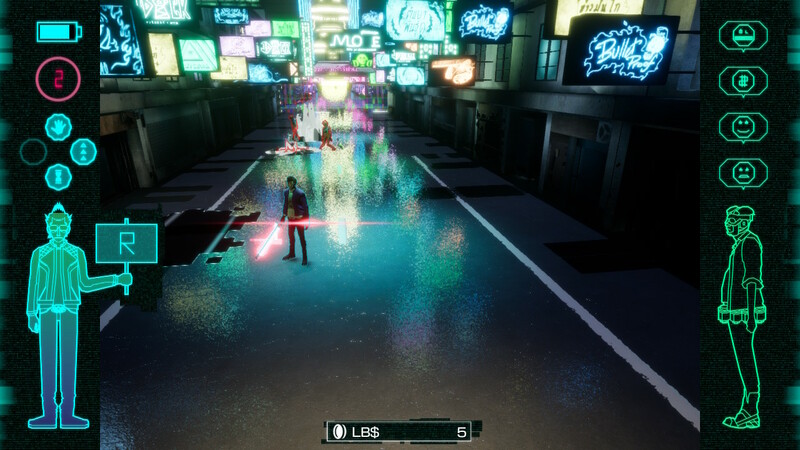 Gameplay in Travis Strikes Again: No More Heroes is primarily a top-down hack-and-slash adventure. I say primarily because it takes advantage of its premise of going through various video games to change things up. Each stage past the first introduces new gimmicks not seen in other levels, such as altering a maze to create a path to a goal or placing a drag-racing minigame between sections. The section between levels is by far the most drastic difference, being a visual novel detailing how Travis tracks down the Death Ball required for the next level. That said, while the variety in options does help keep each segment of the game fresh and different (There’s no way I would confuse one level for another), there’s also the fact that not every gamer likes every type of game. This is even lampshaded in-game, with both the second visual novel section and the drag racing level pointing out that people bought the game for combat and action, and may be disappointed if they don’t get back to it soon. I can absolutely see how many fans would be bothered by these scenes, especially the visual novel sections. While I personally enjoyed the DOS-era style, the 90s anime aesthetic, and the writing, at the same time the first visual novel section took nearly half an hour to get through. Thankfully the rest of them aren’t nearly as long, and all the other non-action breaks in the levels are quite short, but it doesn’t leave the best first impression. One of the points in the game’s favor is the local co-op mode. Two players can take control of both Travis Touchdown and Bad Man, who have their own levels, stat distributions, and unique moves. In fact, I’d go so far as to say that the game is designed to be played multiplayer, with many of the enemies using shields or other tactics that encourage flanking. It’s still quite possible to beat solo, but certain enemies wind up being quite frustrating. A big reason for this frustration, and a point against the game, is the more simplistic combat. 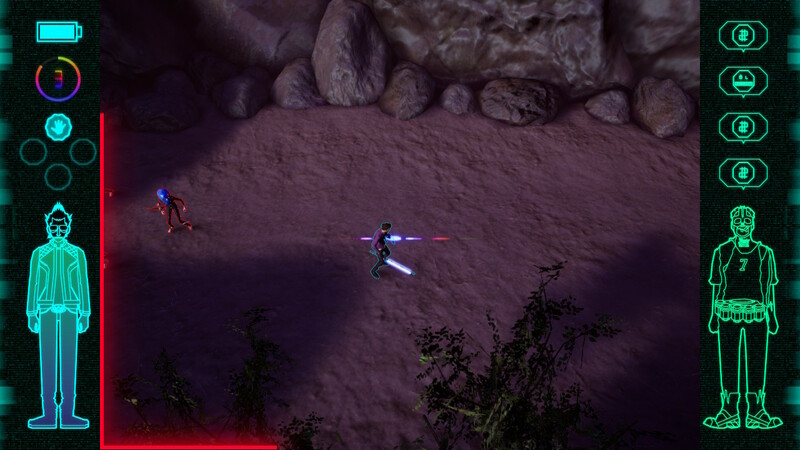 You have a light attack and a heavy attack, as well as collectable skills. The skills aren’t very reliable as bread and butter moves due to their lengthy cooldowns, leaving just your your light and heavy attacks. The game makes it clear early on that it expects you to use heavy attacks on enemies that guard or have more HP, but it leaves you open for a ridiculously long time. This resulted in frequently just whittling down tougher enemies with light attacks and accepting that I would get hit while trying to break guards. 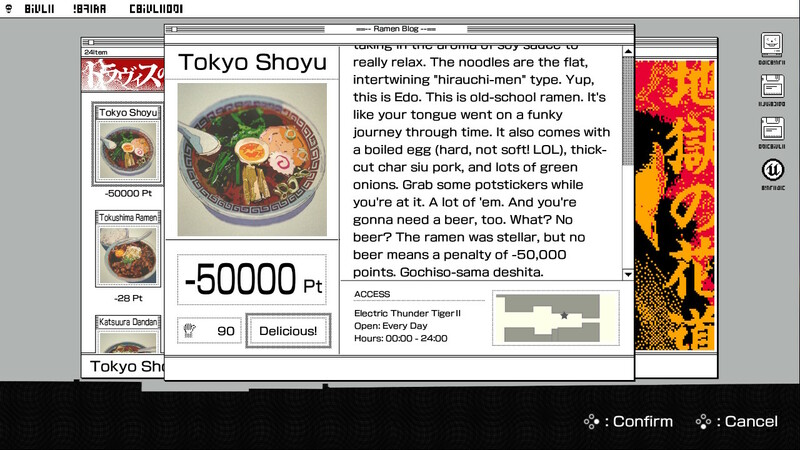 The aesthetic in Travis Strikes Again: No More Heroes seems to be trying to portray itself as an indie title. Each level has a distinct visual style, but they’re all in the style of older games, and this primarily top-down hack-and-slash with fairly simple combat feels like a throwback to yesteryear. They also follow the indie trend of referencing other indie titles, especially Hotline Miami. It’s cute, but it comes across as a little weird when the studio has been making hits since the GameCube era. For better or worse, the game feels like it was made on a shoestring budget. On top of the simpler graphics and gameplay style, there’s hardly any voice acting and the visual novel sections that would have been cutscenes or full levels on their own in other Grasshopper titles are essentially glossed over here. That said, compared to other indie games, it has a lot of quality, if only by the sheer variety of styles it mimics, including DOS, Vector graphics, cyberpunk dystopia, PSX, and even live action. It’s lower quality than the previous titles, but it’s authentically low-quality in a setting that makes it clear they’re going for that in the first place. For some of us, it’s even quite nostalgic. 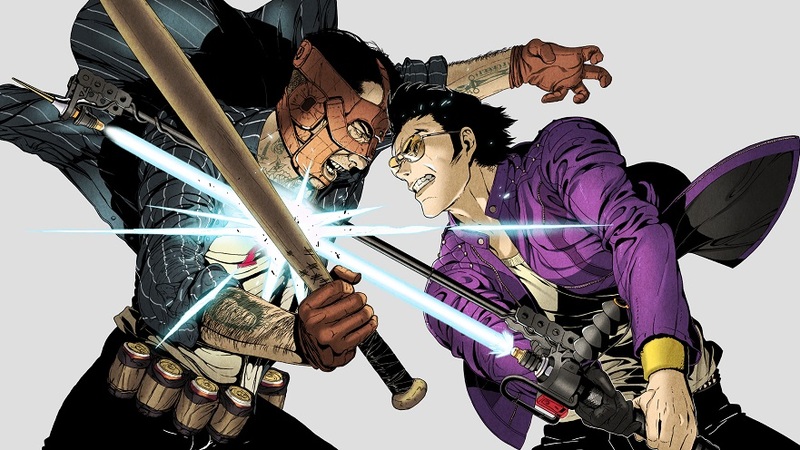 If there’s one take-away I have about Travis Strikes Again: No More Heroes, it’s that it feels like a lower budget take on the series. I’m reminded of when a series on the PSX or GameCube would get a game on the GBA; It’s noticeably different, and not as highly polished, but in the end it’s still fun for what it is. Thankfully at $30 for a digital copy it’s priced more appropriately for the cheaper games it’s emulating. I still find myself hoping this is just a prelude to a No More Heroes 3.
Review copy provided by Grasshoper Manufacture for Switch. Screenshots taken by reviewer.